February | 2014 | That Was an Accident! First you got the whole “boy’s club” line and the whole boy’s club lineup. But no, I say, I’m going to let that go for now, since we don’t know the entirety of the plot yet! There was something else, but I already forgot. Then there was flying, which in WoD thinking is all like, “FAST FLYING AND FLYING IN GENERAL IS BAD.” Well, I like flying dammit, but I logically understand that the huge amount of gold I spent for something I value highly and that something itself are important to me, but not to designers who are thinking about the BIG PICTURE. Shut up, emotions. WoD is gonna be just fiiiiiiiiiiine. Look, I’m not looking to feel smart or skilled when I’m running to the ranged maze path for Durumu, hitting Lightning Bolt over and over. I’m doing it because it’s my only option. 1.) I have to move or die, 2.) one third to half of the LFR group is going to die during the first maze phase so it stands to reason WE HAVE TO GET HIM DOWN before a second occurs or we’ll all flat out die, 3.) I feel stupid just flat out running and Spiritwalker’s Grace is on cooldown, and 4.) I’M FREAKING DPS, I’M SUPPOSED TO MASH ALL THE BUTTONS BECAUSE NUMBERS. Free bonus, you say? Jeebus, talk to a casual player or two. STOP ASKING ME TO MOVE EVERY SECOND WHEN I HAVE TO STAND STILL TWO SECONDS TO CAST A DAMN SPELL. 1.) Gee, does that mean you’re going to get rid of nerf druids, since that’s a huge chunk of what they do? But having to balance between moving and casting makes it INTERESTING, you say! It’s more FUN, you say! If the deeps gotta do it, heals gotta do it too! It’ll be great FOR EVERYBODY. A more challenging game of yayness! TRY HEALING TORTOS AND THEN TELL ME THAT. That sheeyit ain’t fun – that’s annoying. Or a real pisser when people complain about your healing numbers and there’s nothing you can do because OMFG TURTLES EVERYWHERE. There is a freaking reason why I try not to queue for Forgotten Depths as a healer – I HATE IT. This entry was posted in World of Warcraft and tagged /omg, maybe someday will be better, oh the goblinity, warlords of draenor, world of warcraft on February 18, 2014 by Prinnie Powah. Prinnie: While the “Mog the World in 80 Days” contest sounded like a cool idea, I’m just way too lazy to keep up with something that complex for so long. Then I learned there was a Roy G. Biv type contest! What’s this? A contest of just seven six colors? Even I can handle that! The biggest challenge becomes choosing who to represent this blog! Ignitine: Oooooh! MEMEMEMEME! Pick me! Pick me!! I CAN DO THIS. I just hit 90, and you KNOW warlocks get all the neatest stuff! Prinnie: That’s true, they do got a lot of cool stuff. Show us what ya got. Ignitine: THIS VALENTINE’S DAY, REMEMBER TO HUG YOUR TENTACLE MONSTER! Prinnie: ……………. Much warlock. Such shock. Who let you out of the basement again? Ignitine: I’m a shoo-in for victory, I assure you. Thoughts: Normally I prefer to actually get the items in game and literally mog them – it makes me feel accomplished gives me something to do. But given the approaching deadline, I found I had to use Mogit and “pretend,” if you will. There was just no way I was going to be able to get it together, especially since I wanted to post this before Valentine’s Day. While Ignitine is 90 now, this outfit requires a stupid amount of Honor, which is best considered a “long term” kinda goal where I’m concerned. 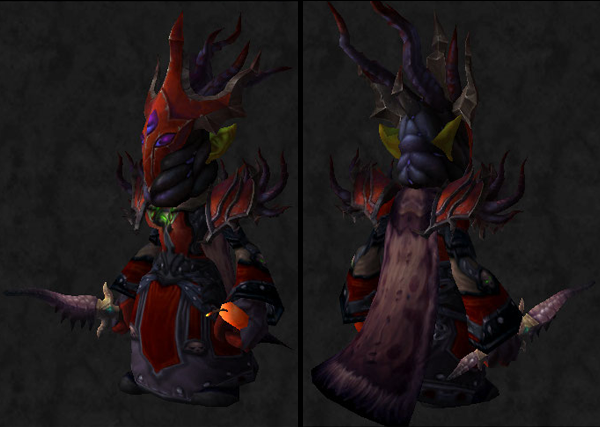 Goa gallantly offered to carry Ignitine to high item level PvP gear tentacle-tastic transmog glory, but I wimped out. This entry was posted in Cloth, For the Horde, Baby!, Goblins, Ignitine, OMGWTF, Transmog, World of Warcraft and tagged auchenai death shroud, cloth, fanged tentacle, furious gladiator's cord of dominance, furious gladiator's felweave raiment, goblins, ignitine, oh the goblinity, the roygbiv tmog contest, thermotastic egg timer, transmogging, tyrannical gladiator's felweave amice, tyrannical gladiator's felweave cowl, tyrannical gladiator's felweave handguards, veteran's mooncloth slippers, warlock, world of warcraft on February 11, 2014 by Prinnie Powah. A momentary tangent on warlock spec abbreviations before we begin: “Destro,” sure, that’s cool. “Aff” or “Afflic,” okay, whatever. It’s “Demo” that I got a problem with, because every time I read it, I see “Demolition.” In my mind, the demolition of something equals the destruction of its existence and destruction OBVIOUSLY equals Destro, so therefore we’re talking about FIREEEEEEE, right? Aaand then I realize that I’m so wrong. I guess “Dem” wouldn’t be that much better, though, since I might just assume that Demonology warlocks all have liberal political beliefs or something. I CAN DO THIS. I WILL GET THIS. Behold the power of positive thinking! … yeah, they were right, Destro is easiest. When Affliction wasn’t looking like a whole lot more management than I could handle, sheeyit kept dying before I finished casting all my damn Affliction DoTs and that annoyed me. So back to Destro it was! YOU CAN’T GO WRONG WITH MORE FIRE. Or rather, it was back to sitting in some inn, accumulating rested EXP. Maybe it was because all the pets but the Voidwalker annoyed me one way or another, but using the Grimoire of Sacrifice was weird, because I didn’t like the lack of a pet either. The prospect of someday attaining green fire wasn’t really all that motivating. Now, if it was purple fire, we’d be talkin’. Green? Eh. I can’t say that it appeals to me on a “I WIN AT WARLOCK” level either, because who’s not paying attention and spamming Immolation? THAT WOULD BE ME. I could never keep up with green fire-set expectations. 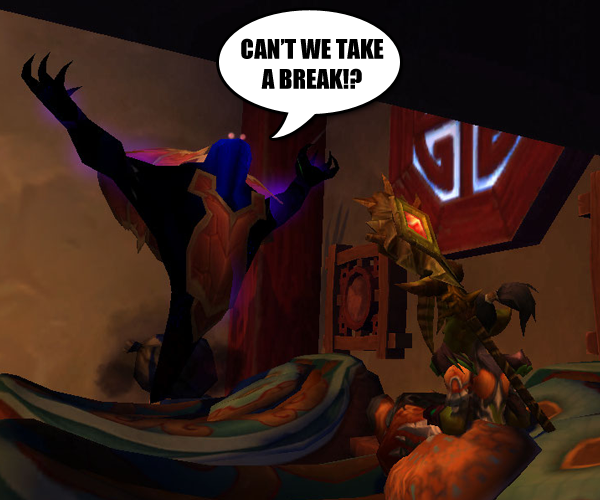 CAN’T WE TAKE A BREAK!? No, because we already did! So Ignitine sat quietly until Goa had another altoholism flareup. At first, while in the 70s, I still felt the mehs. I was pretty sure I had more or less conquered my tendency to spam excessively refresh Immolation, yet I remained at the bottom of the barrel in terms of DPS. Then, too, it’s hard to feel badass when you have to stand still for two seconds to cast and the tank has already dragged all the mobs out of range. But then Ignitine hit 80, and quite suddenly, I was a DPS master! I went from being the total derps of any LFD group to hitting like a ‘zerked raid boss! (Or so I like to think.) My skill level had not increased, nor had I quite overcome my love of hoarding all the embers so I could be on fire as much as possible, but as it turns out, Destro warlock Mastery is SUPER EFFECTIVE. 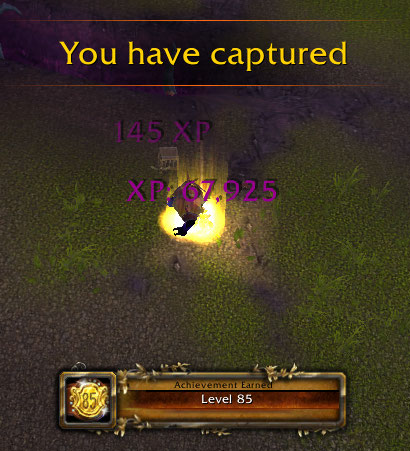 You Have Captured Level 85! Plus, things just kind of got silly, which generally improves my feelings about a class by 10% or more. How the hell am I on fire while underwater in Vashj’ir? I AM WARLOCK. I DO NOT NEED YOUR FOOLISH HUMAN LOGICS. I hit 85 with a pet battle. I AM WARLOCK. I DO WAT I WANT. Every time I go to the Valley, there’s this mushan stuck in a rock. Ignitine’s now level 90, but she does face a challenge – I didn’t anticipate leveling her, so all of the cloth tokens my other characters collected on the Isle went to gear Ailabeth and Esplodine. Poor gal has actually had to go look for the treasure chests on her own! Soon I will be Prepared. But give her time. Then, all the things will be on fire. ALL OF THEM. 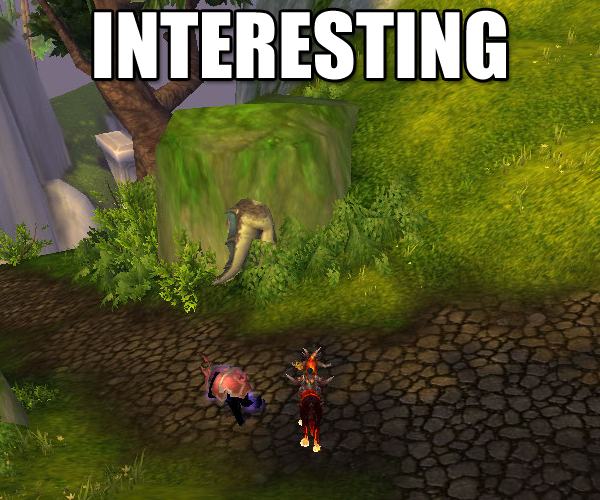 This entry was posted in For the Horde, Baby!, Goblins, Ignitine, World of Warcraft and tagged altoholics anonymous, goblins, ignitine, leveling, lfd, oh the goblinity, world of warcraft on February 9, 2014 by Prinnie Powah.